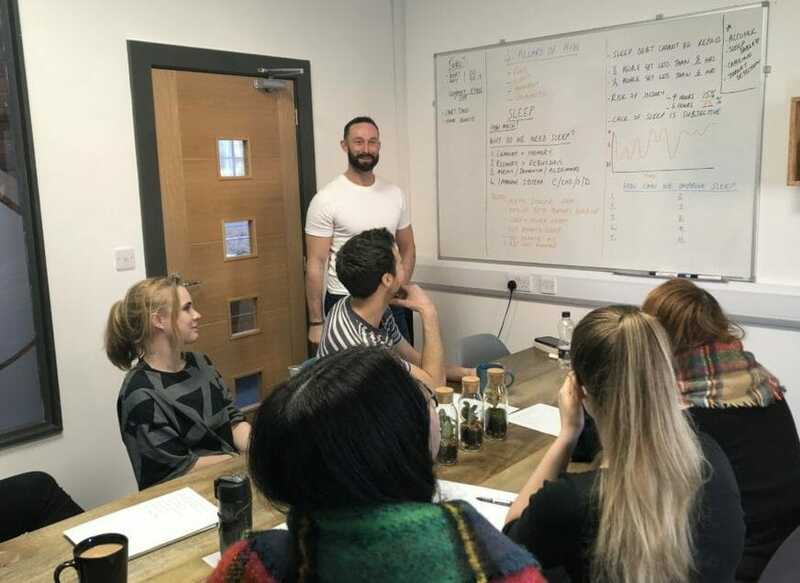 One of the main goals for Brilliant is to create a working environment that promotes wellbeing and gives our team access to things to support that like free gym membership, subsidised healthy lunches and regular wellbeing sessions. This is a collective journey to improve our health — both in the office and at home. Each quarter we’re having a session on one of the four pillars of wellness: Food, Sleep, Movement and Community, and our first one happened this month! The first stop on our quest for mental and physical health and wellbeing, was SLEEP! And how important is sleep? Well, if you like a good scare – have a read of this excerpt from “Why We Sleep: The New Science of Sleep and Dreams” by Matthew Walker, in fact just go and buy this book, it will change your life! HOW CAN WE IMPROVE SLEEP? Light – stop looking at your phone before bed! Unnatural light and especially blue light really affects your sleep. So, looking at your phone, TV or laptop – and having bright lights on in the house in the hours before you go to bed, can make it difficult to a) drift off and b) sleep soundly through the night. Give your eyes a rest a few hours before bed or think about installing Flux or using night mode on your phone to make it red light rather than blue. Food – when you’re sleeping, your body is recovering, and what you put into your body affects how well your body regenerates. So, a healthy balanced diet is key, as is making sure you don’t go to bed hungry or too full, and obvious as it may sound – don’t eat or drink anything with caffine in it in the evening – chocolate included! Exercise – being active and looking after your body help you to release energy in a healthy way. We all know exercise is good for us, and and here’s just another reason why. Whether it’s walking the dog, going to the gym or doing a bit of yoga – get that body moving for a better night’s sleep. Supplements – Magnesium is a nutrient that the body needs to stay healthy but sadly the soil our food is grown in is pretty deplete so taking a supplement (for overall health not just sleeep) is seriously beneficial. Even better, taking magnesium before bed (in tablet form, or you can go all out and take a bath in the stuff!) will help you drift off like a dream and stay in a deep sleep. Routine – this one is super important. How many people have different routines for weekdays and through the week? This takes a huge toll on the body, as it messes with your natural rhythm, making it very hard to adapt when it comes to getting back into the work week. We’ve all repeated that old trope about Mondays. Environment – a messy room makes for a bad night’s sleep. It’s as simple as that. Give yourself and your environment a little TLC and you’ll reap the rewards. Lifestyle – a chaotic lifestyle will affect you similarly, a little organisation and TLC goes a long way! Noise – noisy neighbours, children, traffic, housemates etc., they drive us crazy and they ruin our sleep! Some things that may help are to listen to white noise or soothing music soundtrack. Also, going back to your phone, get it onto airplane mode so that those notifications aren’t disrupting you! Temperature – either too hot or too cold, the temperature of your room can have a really negative effect on your sleep. Apparently, the perfect temperature for sleep is 18°C. Hydration – if you drink too much before bed you’re likely to be up in the night. But not drinking enough also won’t do. The perfect level of hydration is super subjective, so it’s up to you to work out what’s best for your body and make sure you’re getting that all important H2O… and if you want a really good night’s sleep then don’t drink alcohol before going to bed! Sleep Cycle – this is a free app you can get on your phone! It tracks your sleep throughout the night, recording when you’re awake, asleep and in deep sleep. Apparently, we sleep in 90 minute cycles, moving between these three states throughout the night. Sleep Cycle helps to track your sleep and inform whether you’re getting a good one. It also has an alarm, which you can set to wake you up at some point during a set time period. The app will wait until you are at the more “awake” stage of your sleep cycle, so that when you wake up you feel refreshed and ready to get up… plus it’s a gentle sound not a noisy beeping alarm – Genius! Since downloading this app and making a few simple changes in line with Joel’s recommendations – members of the team have noted a marked difference in the quality of their sleep. And a well-rested and happy team makes for a motivated and productive team. Some may even say, a Brilliant team. Keep an eye on the blog for the next phase of our health and wellbeing quest, where we’ll be talking about food. My all time favourite topic and ultimately, the best part of my day!